A well run music festival can be a fantasy land, a respite from reality. Such was the case at the Peach Music Festival in Scranton, PA this past weekend. As concertgoers reveled in musical bliss, the world around them grew darker and stormier. Unimaginable horrors were unfolding. Music, blasted from three stages across picturesque Montage Mountain, formed a barrier, shielding those in the vicinity from outside influences. The focus was friends, family and fun. That was the intent and, with little exception, everyone on the festival grounds, musicians, fans, security and vendors alike obliged like it was an unwritten rule. Like a peach, the festival was fuzzy on the outside, sweet and juicy on the inside. Smiling was the face fashion of the weekend. “Strangers stopping strangers just to shake their hands,” sung early in Joe Russo’s Almost Dead’s Thursday evening headline set, elicited a real life recreation of the lyrics with strangers literally shaking each others hands, meeting for the first time and happy to be acquainted and dancing together for the next four nights. The venue staff, dressed in bright orange shirts with a graphic of a hand holding up the peace sign, were labelled as “Safety” rather than Security. They were constantly circulating through the crowd, dancing and grooving along the way, just as likely to be asking how you were doing as they were telling you what to do. And the kind vibes were returned, fans offering the staff snacks, hugs and even including them in their group shots. In a moment that nearly disrupted the peaceful atmosphere, a couple of cops came into the crowd on the prowl for a specific someone. Though it wasn’t for a bust, they just wanted to say hi to an old friend and give her a hug. Fans wandering through the crowd were quick with high fives, fist bumps, a quick dance or even a hug for fellow fans. Everywhere you turned excited reunions were happening with friends both old and new. Fuzzy! 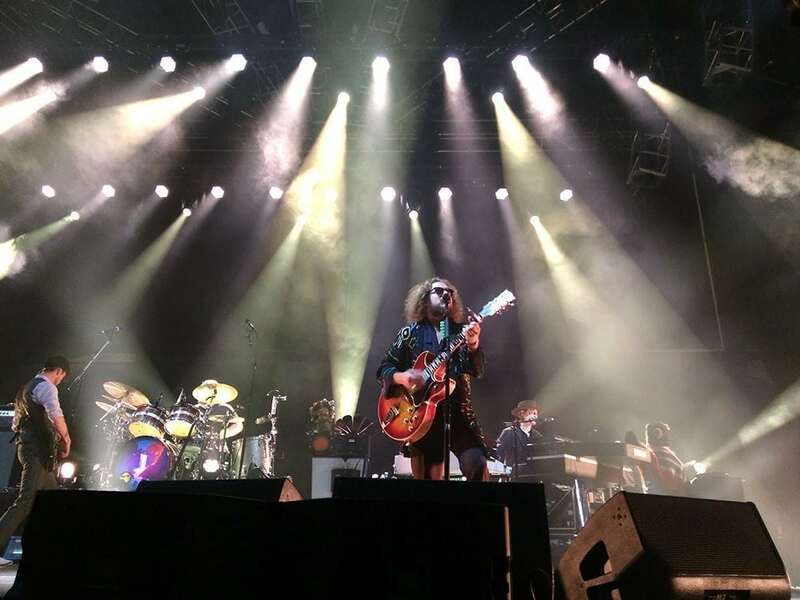 The festival, started by the Allman Brothers, thoroughly maintains the spirit of the band, even as they become a more distant memory with each passing year. Allman Brothers t-shirts, still available at the merch booth, totaled more than twice that of any other band shirt represented at the festival among the crowd. The main stages, The Peach and The Mushroom, both harken to the symbolism of the band, while the path connecting them, Skydog Way, honors the late Duane Allman. With two original members in Gregg Allman and Butch Trucks passing this year, there was more honoring to be done. The much anticipated set specifically honoring them with an all-star band was Saturday afternoon. 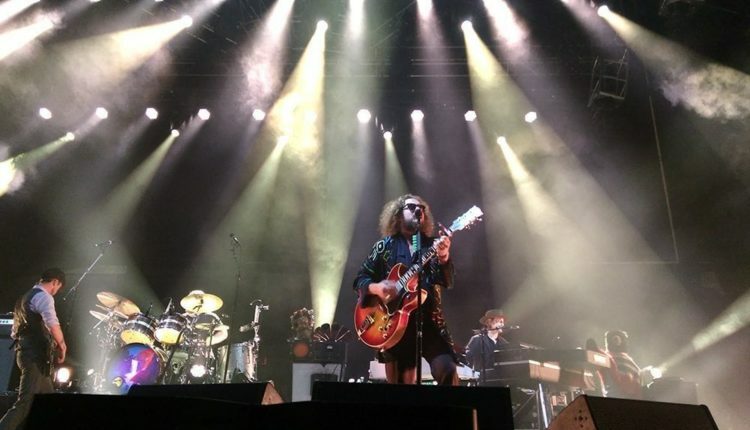 But even before that time, My Morning Jacket was busting out a cover of “Melissa” during their set on Friday night. Pink Talking Fish shed their raison d’etre to present their version of the Allman Brothers’ classic Eat a Peach album later that night. Saturday’s tribute set, lead by keyboardist Chuck Leavell, featured a rotating cast, a who’s who of Allman Brother’s past. As ex-Gregg Allman Band guitarist Scott Sharrard remarked earlier in the day during his solo band set, “The Allman family runs far and deep. I’ve been seeing a lot of familiar faces.” Dave Schools and Jimmy Herring emerged for “Dreams,” Duane Betts and Marcus King lent their signature dual guitar sound on “Southbound,” Warren Haynes took control for a rousing “Come and Go Blues” and the quintessential “Whipping Post” while the crowd gave it all they had as the backing singers on nearly every tune. It was a tribute set that delivered on all fronts. Leavell decided to “honor some other fallen brothers” and closed the set with “Yield Not to Temptation” for Col. Bruce Hampton, followed by a song to honor Jim Hall. There were more tributes to be had throughout, both for those who have passed on and those still with us. Joe Russo’s Almost Dead maintained their reputation of exploring the music of the Grateful Dead across two sets, blazing new trails on tunes like “King Solomon’s Marbles,” “The Eleven” and “Let It Grow,” though they did squeeze in their lone original, “Keeping It Simple.” The show-closing “Morning Dew” remained mostly intact; even they know you don’t mess with perfection. My Morning Jacket’s “Melissa” was played in a quasi-medley with Prince’s “The Beautiful Ones,” George Harrison’s “All Things Must Pass” and Bob Dylan’s “Blowing in the Wind.” Steve Kimock sandwiched his set between two songs from the Jerry Garcia Band catalog, opening with “My Brothers and Sisters” and closing with “Waiting for a Miracle.” Holly Bowling played her renditions of both Phish and Dead tunes to the somewhat unusual sight of a crowd dancing to solo piano. Everyone has their heroes to honor. Widespread Panic also brought out guests, though they didn’t return the favor to Haynes. Instead, they invited out two young guitarists. Brandon “Taz” Niederauer showed off his skills going back and forth with a wide-smiled Herring on “Surprise Valley” and Marcus King joined on a heavy “Me and the Devil Blues.” Panic’s song choices were seemingly one of the only references to the events in the outside world all weekend. Possibly unintentional, but many tunes like “Pilgrims,” “Cease Fire,” “Life During Wartime,” and “Lawyers Guns and Money” certainly felt relevant. Continuing into their second performance on Sunday, they opened with “Hope in a Hopeless World” before ending the whole festival on a more hopeful note with “Ain’t Life Grand.” Regardless, the magic of Panic’s music comes between the songs, and on that front they delivered some doozies. “Big Woolly Mammoth” and “Party at Your Mama’s House” both ended in dazzling segue jams on Saturday night, while “Bear’s Gone Fishin'” and “Second Skin” traveled into highlight-worthy territory as they eventually wound around into the next song. A small jaunt off the beaten path, The Grove was the place to find fruit ripe on the tree and we spotted some ready to be picked. Caverns thrilled with their heavy, near metal, psychedelic rock, featuring reverb-drenched vocals and heart-pounding drumming. Lespecial jumped genres and borders quickly and continually for a head-spinning set that combined Indian, Latin, Caribbean and more, delivered with an electronic groove. Ghost of Paul Revere brought the blues to the acoustic string band, with the leads coming from a fantastic harmonica player who, using various effects, elicited some rather unique sounds from his instrument. Arizona quartet Spafford commanded an overflow crowd showing why they’ve been pegged as the next big thing in jambands. Hayley Jane impressed with a rock-ready voice and stage presence, backed by her band The Primates and joined on stage by the coordinated interpretive dance stylings of the Interstellar Dancers. After four short days, it wasn’t without hesitation that the crowds left the shielded wonderland of music. The dream couldn’t last forever. Until next year, peach and love! A graphic designer living in Rochester, the only musical bones in Eli's body reside in his inner ears, which he tries to exercise on a regular basis.